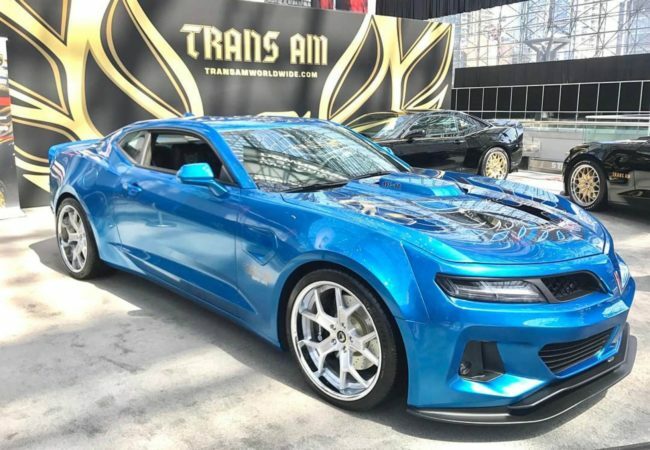 The Camaro Trans is the true supercar unveiled this week at the 2017 New York auto show but surprisingly it doesn’t come from the General Motors. The car you see here comes from the expert builders at Trans Am Depot and features a marvelous retro body developed in-house with the help of Swedish design firm Zolland Design. It’s called the Trans Am 455 Super Duty, and it’s packing a supercharged V-8 delivering 1,000 horsepower and 1,046 pound-feet of torque. This means, that’s 160 hp and 276 lb-ft more than the Dodge Challenger SRT Demon Damm!! Trans Am has been building cars for several years, all based on the fifth generation Camaro platform. The engine is based on the 6.2-liter LT1 V-8 found in the Camaro SS but has been worked over by a NASCAR engine builder to 7.4 liters, or approximately 455 cubic inches, The engine also benefits from a cold air intake, ceramic-coated headers and a 3.0-inch exhaust. The car has been lowered by an inch from its standard Camaro stance with meaty 305/35R20 Michelin Pilot Sport 4S tires out back. Optional Brembo six-piston front brakes provide plenty of stopping power, measuring in at 15.0 inches x 1.3 inches in the front and 15.0 inches x 1.1 inches in the rear. The car on display in New York is a standard coupe but you’ll be able to order a T-top with glass panels.